This mod adds a series of special moves which consume Magicka. They are similar to "magic sword" abilities found in other games. I created this mod using only animations and visual effects found in vanilla Skyrim. 2018 03.10 1.2 Optimized scripts. Replaced Revenge with Kick Bash. Disappeared magic effect when special attack animation is failed. Improved animation smoothly at the start of the human additional attacks. No Support for skyrim 1.8. Sound disable, strange shadow bug fixed. Change pursuit,rend,handle attack,bloody strike animations for bug fixed. Player do not stagger when you use with Ultimate Combat. 2013 01.26 GamePad mode while equipped magic bug fixed. High-speed movement bug, camera flickering bug, instant death bug fixed (probably). Attack with stagger does not work when victim is blocking. Key reset every time load game bug fixed. 2013 02.23 Instantly die bug fixed (maybe). All of special melee attack super armor added. "Revenge" effects of the reflection for enemy fixed. Thrown resist 15 to 20 seconds. Some special moves do not effect none-hostile actors. 2013 02.01 0.6 MCM load bug fixed. Some special moves super aromor added. Skill xp does not increase bug fixed. "Move extremely quickly bug" reduced. Special moves for bows is now activated when released. Multishot’s nine arrows are increased to twelve arrows, arrow speed is twice, and the arrows burst quickly. Area of explosion and barrier of “Revenge” is twice. Maximum damage increased. Staggering added when “Bloody Strike” hit. This mod adds a series of special moves which consume Magicka. They are similar to "magic sword" abilities found in other games. 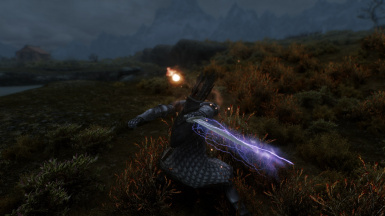 I created this mod using only animations and visual effects found in vanilla Skyrim. 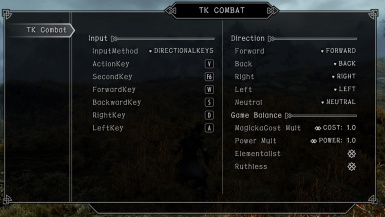 The purpose of this mod is to improve the player's combat experience, like "TK Dodge" and "TK HItsStop". It is an experimental mod. Finally, I will plan to create as another mod which player adds attack animation without magic before long. Have you ever found switching spells in Skyrim annoying? That is the reason why I started to make this mod. 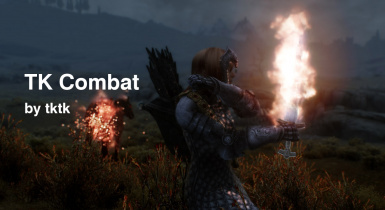 This mod aims to improve the combat in Skyrim (a little) by integrating magic skill with weapon attacks. You know, like you get in other video games. It also has some "special moves" which enhance normal attacks, for example "Pursuit", "Shield Breaker" and more. See below for detailed descriptions. My goal is to achieve a modest balance, not to cheat. I really hope you will enjoy using these special moves. Power and magicka cost can be adjusted to your liking by using the MCM menu. Option files are included in this package. If you use PCEA(PC Exclusive Animation Path), you must use "option - PCEA Patch". Data folder move to your Skyrim installation folder. Use the console command first to input below command before deleting it. Then save, deactivate mod and delete the files. You can customize in MCM. Choose operation to use the special moves. Directional key + Action key (default: V). II. Press a directional key and then the Action key. When using an attack with a directional key, press it first before the Action key. Otherwise, the attack will not work. The mode is recommended for keyboard users. When the mod loads the first time, if the mod detects that you are using a keyboard this option will be selected by default. Analog stick + actionkey(default : RB). The mode is the only mode which actually works with a gamepad/Xbox controller. It will be selected by default when the mod loads for the first time if it recognizes that you are using a gamepad. RB button is already assigned "shout".So I recommend this mod use with a key remap mod (e.g.. Skyrim Pad Config, Simple Custom Controller Map, Xbox360 Controller KeyRemap). Quick and easy. Free key binding, and one-push activation. For example, F1:Actionkey. ("Neutral" special moves, which is like "Night Orb" or "Rain of Arrow") F2: ForwardKey ("Teleport" or "Revenge" etc.)? "Direction" is custom setting to change directional bindings of special moves. For example, changing "Forward" to backward, The archer will get "multishot" activated instead of "Teleport" for that key. At present one-handed weapons, two-handed weapons, bows, crossbows and shields are usable with this mod. Most damage dealt by these moves is dependent on the player's skill in destruction. In turn, they will increase the player's destruction skill. These are "friendly fire" moves which will not hurt your followers. Unlike normal spells, the cost of performing these special moves can never be decreased. As long as you have enough magicka you will be able to execute them from the beginning of the game, although their power will be weak. One-handed weapons can inflict each of the three elemental damage types (exception: daggers cannot deal fire damage). A special action with an unenchanted one-handed sword will take on the attack's enchantment for 15 seconds. While Elementalist is active, three seconds is added to the duration of same special move effects. A pre-enchanted weapon will take on the enchantment only during the special attack. Nothing will happen with weapons the player has enchanted him/herself. Enchanting power depends on the player's skill in enchanting. Cooldown: 60 seconds. This duration is shared with "Ruthless". Most of your attacks will score a critical hit while the enemy is fleeing, staggering or bleeding out. You will automatically move faster when the enemy is within eight feet of you. Due to the way Skyrim is built, critical hits cannot be scored consecutively. Throws a magical dagger which will do double damage when you are undetected by the target. The dagger cannot be picked up, but it will be cleared like arrows when you change areas. The power of this attack depends on the player's skill in sneak and the base damage of the equipped dagger. This attack can stagger and inflict a critical hit on an opponent who is blocking or using a ward spell. Damage is increased 50% for both player and NPC while this attack is performed. A jumping stab that restores health upon striking the opponent. The player will automatically move faster when the enemy is within eight feet. The amount of health restored depends on the player's skill in restoration. The target in front of you is thrown into the air and then struck down by a bolt of lightning. The lightning will miss occasionally. Targets can be lifted only once every 20 seconds. Does not work on flying targets. This attack depends on the player's skill in destruction. Summons a barrage of six water blasts that move in a straight line from the player. Each blast staggers NPCs and deals damage to Health and Stamina. The impact point of the last two blasts can be adjusted by changing the player's direction. A spinning slash that causes five-second bleeding damage to all nearby enemies. As the player slashes, two fireballs are released at twice the speed of the normal Firebolt spell, staggering the target. The damage output depends on your destruction magic skill, and the used element is Fire. Adds the "Ruthless" ability for special attacks using two-handed weapons. This makes two-handed combat easier. Increases attack speed, chance for a critical hit, critical damage, magic resistance and bow/crossbow attack resistance for 15 seconds. While Ruthless is active, three seconds is added to the duration of all special move effects. Cool-down: 60 seconds. This duration is shared with "Elementalist". The player's body will take on a blue glow while this ability is active. Note: The speed of some special attacks (those using kill-move animations) does not change. Kick bash has stagger. It is more effective while NPC is blocking. Pulls an enemy to within ten feet of the player and then absorbs health when the target is stabbed. The amount of health absorbed depends on the player's skill in destruction. Calls forth an explosion to smash enemies thrown into the air. Targets can be thrown only once every 20 seconds. This move depends on the player's skill in destruction. A strike that staggers and deals critical damage while an enemy is attacking. Damage is increased 50% for both the player and NPCs during this attack. Compared to normal attacks that start quickly, this one takes a little time to get going. The player spins around, hitting all targets in front. This attack deals double damage and staggers opponents. Enemies killed by this attack will explode. Bows and crossbows produce the same effect, but bows are now drawn automatically. Press the Action key when fully drawn to activate. Teleports to a target point. Snaps to the game's navmesh, so is often off the target point. You may find it difficult to use this for climbing steep roofs etc. Fires a volley of nine magic arrows. Each affected target will be hit by one arrow. This attack depends on the player's skill in archery. Places a rune which explodes when stepped on by the enemy. The rune can be placed further away than the normal magic rune destruction spell. This action depends on the player's skill in destruction. Non-elemental. Fires a magic arrow that seeks out opponents. Five arrows will then fall from the sky and explode on the targets. This move depends on the player's skill in destruction. Non-elemental. Casts a ward spell automatically when the player presses the action key (default: v) once while shield blocking. The spell ceases when the player stops blocking. Occasionally elementalist effect occurs below the foot or other weapon. If you use FNIS6.0 or more , it will not work correctly. Requires a patch. Install FNIS 7.2. *if you already done, skip this step. Check in tktk1's "TK Dodge / Ultimate Combat", and then press FNIS update button. TK Dodge - Player adds dodge animation. TK Hitstop - Gives a physical feeling when player's attack hits. TK Recoil: Apply recoil effect when shooting a bow or crossbow or staff. Adds stylish action game animations. Adds a way to learn special moves in the game. AltheaR - Translated to English. Bechamimi - Translated to English.